Life on the Line: Coming of Age Between Nations premiered September 2014. A year in the life of 11-year-old Kimberly Torrez. 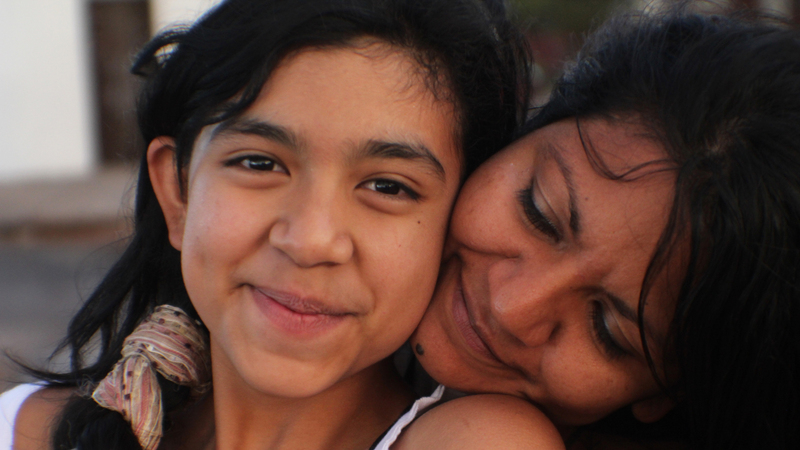 In Life on the Line, filmmakers Jen Gilomen and Sally Rubin of Fine Line Films illuminate the changing face of America through the personal story of 11-year-old Kimberly Torrez. This half-hour documentary follows a year in the life of Kimberly and her family, exposing the challenges of immigration and the U.S./Mexico border through the eyes of one child. Living in Nogales, Mexico, Kimberly crosses the border each day to go to school in Nogales, Arizona. While her father finds himself unemployed, stricken with Hepatitis C, and in need of a liver transplant, her mother desperately awaits the visa that will allow the family to move back to the U.S. Meanwhile, Kimberly struggles to keep up with school attendance and grades, facing the dangers of the border each day. This touching and educational film leaves politics aside to give viewers an inside look at what life is like for millions of children “on the line” between nations and identities. Like Kimberly, these U.S. citizens live in Mexico but commute to school in the U.S., in most cases breaking the law to obtain their education. Straddling two countries, these students symbolize the bifurcated state of our shifting immigration policies, which are contentious and have no ready solutions. As Kimberly and the Torrez family face a future divided, so do so many others. About the filmmakers: Jen Gilomen, co-director and cinematographer, and Sally Rubin, co-director and editor, are the independent documentary filmmaking duo behind Fine Line Films. After working on numerous documentary and new media projects separately, they completed their first nationally-distributed documentary, Deep Down, in 2010. Deep Down was co-produced with station partner KET, broadcast nationally on the PBS Series Independent Lens, screened in over 200 communities via ITVS’s Community Cinema program and other festivals, is distributed by ITVS and New Day Films, and participated in the U.S. State Department’s American Documentary Showcase program, reaching audiences from Kentucky to Belarus. Deep Down was a transmedia project employing deep online engagement strategies that included the Virtual Mine, an interactive virtual reality game funded by ITVS and MacArthur Foundation. Deep Down and the Virtual Mine garnered an Emmy nomination in the category of New Approaches to News and Documentary in 2011. Life on the Line was produced by Fine Line Films and presented by Eight Arizona PBS.